An extravagant 18ct white gold 0.70ct diamond engagement ring set with a emarald cut diamond surrounded by a diamond halo and set on diamond embellished entwined shoulders.Two princess-cut blue sapphire, the signature stone of the collection, sits underneath the head. 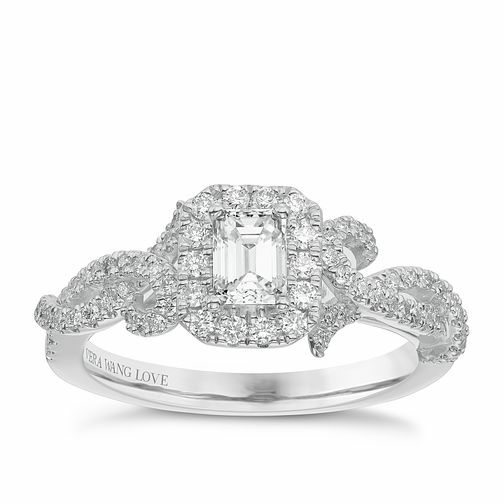 Vera Wang 18ct White Gold 0.70ct Diamond Halo Ring is rated 5.0 out of 5 by 1. Rated 5 out of 5 by Anonymous from Amazing! This ring needs to be seen in person to give it justice.....it sparkles beautifully!! Would highly recommend!